Are you ready for an exciting adventure? Let's be off. This trip is not through strip and mall territory. There are no corporate fast food restaurants until you reach Amherst. Be prepared. Pack a lunch. Fill your gas tank. At Parrsboro, the Glooscap Trail heads north toward Springhill and Amherst. That's not the way you want to go unless you're in a hurry to get to Amherst. We're going travel Highway #209 that parallels the Minas Channel. It's one of the most interesting drives in Nova Scotia. The first few miles of #209 passes through spruce bog, fields of wild blueberry bushes and coniferous forest. Watch for signs to Fox River Look-Off for a marvelous view over the Minas Channel. If you can believe an old fisherman with a sense of humour, on a clear day you might see the outline of the Cape Split headlands on the far shore. Stop down the road in Port Greville for a look at the oldest American elm tree in Nova Scotia. It's growing right by the Highway and is signed. The elm is 75 feet high, 25 feet in circumference, approximately 150 years old and not yet affected by Dutch Elm disease. You can't miss it! Turn onto the Port Greville Beach road. This beach is great for shelling, rock-hounding and finding sea treasures. It's also a favourite for dulce gatherers. Still in Port Greville, the Age-of-Sail Heritage Centre presents the story of lumbering and shipbuilding along the Minas Channel. The history of shore communities is also well told. For those with roots in the area, the Centre's genealogical data base is an invaluable resource. 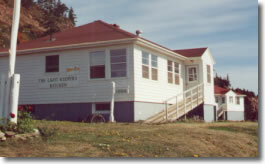 The site which includes a blacksmith Shop and Port Greville Light is open June through September. There are lots of great photo taking opportunities along #209. We pulled onto Bennett Road to take pictures of an old cemetery on a far hill and were rewarded with a colourful landscape. Fields and hills of wild blueberry plants had turned autumn crimson. Yellow Loosestrife grew in abundance, its colour striking against the green shades of pine forests on far hills. We stepped out of our vehicle into a roadside patch of blueberries. Mmm good! Next stop, Spencer Island. 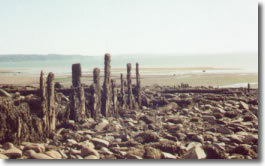 Old pilings from the era of ship building can still be seen on the beach. 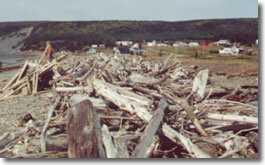 Spencer Island is best known as the port where the brigantine, Mary Celeste was built and launched in 1861. The ship, first named "Amazon", was renamed Mary Celeste in 1868. She was found drifting, 600 miles off the coast of Gibralter on December 5, 1872. The ship had been abandoned in haste and had drifted for some days before being sighted and boarded. The Captain, his wife, baby, crew and the ship's cat were never found. Spencer Island beach is a great place for rock-hounding. When beachcombing, always be aware of tides. 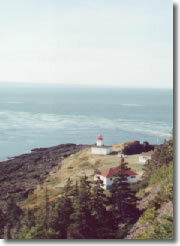 Cape d'Or Lighthouse and headlands lie at least three miles off Highway #209. If you don't make the trip, you'll miss some of the most dramatic sea views in Nova Scotia. Follow signs for the Lighthouse, Lighthouse Kitchen and Guest House - small signs albeit. Don't expect to find huge glaring billboards in Nova Scotia. When you arrive at the site, don't be fooled by the small white building beside the parking lot on top of the cliff. This is not what you came to see. Get out of your vehicle and walk to the observation platform. The lighthouse is below you on a wild bit of land. Views from the top are spectacular; views from the bottom unsurpassed. There's a rough road down the cliff but if you're not staying at the guest house, you'll have to hike down to the lighthouse. A sign does warn that the climb back up is more strenuous than it appears. It is! When you're at light level, you'll notice signs warning that cliffs are unstable and dangerous, so use common sense and stay well back from crumbling edges and high seas. Be sure to bring your camera. This area presents some great picture taking opportunities. There's a surprise at the bottom - The Lightkeepers Kitchen and Guest House. What a place to spend a night! Before your long climb up the rough road, drop in for a chat, tea and muffins, or lunch. For a less strenuous climb back up the road, walk up in zigzag fashion rather than in a straight line. As one local said - Think like a dog. Go from here to there and back and forth, left to right to left. It works! Ready for the next stop? Sweeping Advocate Bay lies just down the road from Cape d'Or. 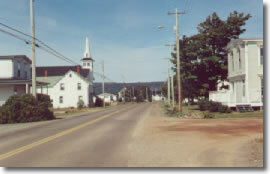 The village has an Acadian look as buildings are built tight to both sides of the Highway. During low tides, clam diggers go out on the mud flats on all terrain vehicles. These people can read tides and know when to retreat to shore. Watching them is fun. Occasionally there'll be a horse drawn wagon show up on the mud flats too. 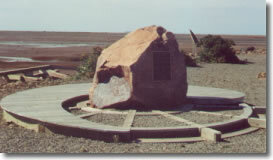 A memorial on the shore at Advocate Bay is dedicated to all area people who have lost their lives at sea. Next not-to-be-missed attraction is Advocate Beach, accessed at West Advocate. Watch closely for signs. Again they are small and unobtrusive. 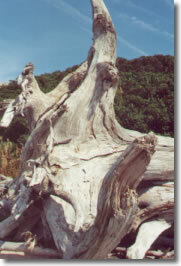 Spend several hours wandering through, up and over piles of driftwood that stretch down the beach for five miles. It's free for the taking too. Dare you to fill your trunk! 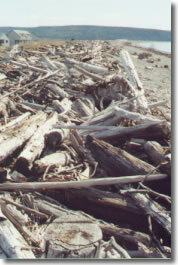 Winds and tidal currents pile hundreds of tons of driftwood on this shore. What a place for beachcombing. On windy days people walk the dyke trail behind the beach to access the piles. Remember that when the sea is angry, Advocate Beach is not the place to be! For those who are experienced hikers and physically fit people there's a new park being developed just past Advocate. A large natural area has been set aside for Cape Chegnecto Provincial Park which is in the development stage. The park presently has walk-in and back country camp sites. Rough trails lead to magnificent views of Minas Channel, Chegnecto Bay and soaring headlands. The coastal hiking trail is strenuous. Trails do have steep sided canyons that have to be negotiated. The Park, at the moment, is for the serious hiker and adventurer. For those of us who like less strenuous adventure, leave Advocate Beach and drive for approximately 30 miles past Apple River and on to Joggins. This route is unique for its total lack of traffic and amenities. In a number of places bailey bridges are set at peculiar angles to the road. With no service stations, no restaurants and in some places no hydro poles, you might think you've landed at the end of nowhere. Anyone you do see along the way, usually waves. You will see plenty of partridge. They come at you from all sides. Occasionally deer and fox cross in front of your vehicle. Highway #209 eventually intersects with #242 that leads to Joggins. First stop in the small village, known for its fossils, should be at Joggins Fossil Centre to get a close peek at what you should be watching for at Joggins Cliff. Want a snack? 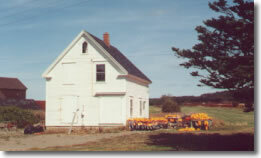 A General Store is located across the road from the Fossil Centre. Follow signs to Joggins Cliff, sometimes referred to as "The Cliff". 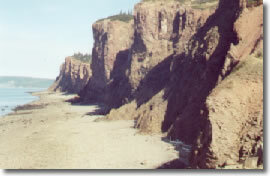 Try to time your visit to be at the cliff during receding or low tide. As Joggins Cliff is a protected site you can eye-ball only. This fascinating area tells the story of an ancient forest growing on a flood plain where rivers ran, continuously flooded their banks and shifting course. Horsetail plants grew in the thick underbrush. Today, layers of yellow-brown clay show clear traces of fossilized roots. 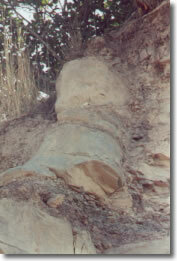 High up on the cliffs, large fossilized tree trunks stand upright, rooted in coal that was the previous lush forest floor. After leaving Joggins some folks make their way across country toward Springhill to see the Anne Murray Centre and Tour-a-Mine & Springhill Miners Museum. In 1958, Springhill was the scene of a terrible mining disaster known as the 1958 Bump. Anne Murray is a well known Canadian singer. Other folks head to Amherst, a full-service community, known for its Victorian streetscapes, downtown murals, museums and festivals. 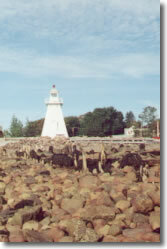 Amherst is the gateway to Nova Scotia for those people arriving via New Brunswick. It is well situated at the junction of Route #6, the Sunrise Trail and #2 The Glooscap. We prefer to drive along #302 and #366 to Amherst Shore Country Inn on the Northumberland Straits. The Inn is wonderful and comes highly recommended. Folks are friendly A by-reservation four-course gourmet dinner is preceded by cocktails. Rooms are well appointed. Ours had a Jacuzzi that was much appreciated. Vegetable and flower gardens are spectacular. The proprietors grow a healthy proportion of the food they serve. The Amherst Shore Country Inn makes a great place to relax for several days while taking in local sites and attractions.